What's the Difference Between A, B, and C Class Motorhomes? Perhaps you’re thinking of purchasing a motorhome for that perfect vacation that you’ve always wanted. Or maybe you own one and you’re thinking about upgrading. No matter what the reason, the decision to purchase a new motorhome must be made with care. That’s why we’ve compiled this list of the differences between the three major classes of motorhomes, known as Class A, Class B, and Class C.
The Class A motorhomes are the largest and most spacious on the market. They are usually about the same size as a bus or a truck, and many have separate bedrooms and kitchens so there’s plenty of room for folks to sleep. Some Class A motorhomes are so large that up to 10 people can find a space inside to lay their head. The bathrooms as well tend to be larger than one would expect. This class of motorhome is popular with those who spend part or all of their time on the road since the interior proves to be a comfortable setting, almost akin to a small apartment. However, the size of this class is also a disadvantage. A caveat with this class of motorhome is that the fuel usage depending on use can be high, with many models getting only 10 miles per gallon or less. And because of their great size, parking can be an issue. On the other end of the spectrum are the Class B motorhomes. These have the bare minimum you need to go camping. They have the same appearance as a van and typically have a toilet and shower. This is a good motorhome for the traveler on a budget. The sticker price is lower than Class A and the fuel efficiency is much better, too. The main detriment with Class B motorhomes is the lack of space. If you are used to camping with a lot of accouterments, then the size and storage capabilities of the Class B motorhome may seem lacking. But on the other hand, it’s much easier to find a parking space for a vehicle of its size. For those who are looking for something in-between the Class A and the Class B motorhomes, the Class C motorhome may serve as just the perfect fit. These motorhomes are notable for an overhang that rests over the cabin. This overhang is usually home to a sleeping area. Because the sleeping area is tucked away, there is more room in the rest of the motorhome for a living room, kitchen, and bathroom; in fact, typically up to 8 people can travel comfortably in this type of vehicle. The overall size of the motorhome and gas efficiency is between that of the Class A and the Class B categories. Class C motorhomes might not be able to fit in a standard parking spot, but it’s much more maneuverable than the truck-sized motorhomes. If you’re interested in acquiring a new motorhome, there are many factors to consider. 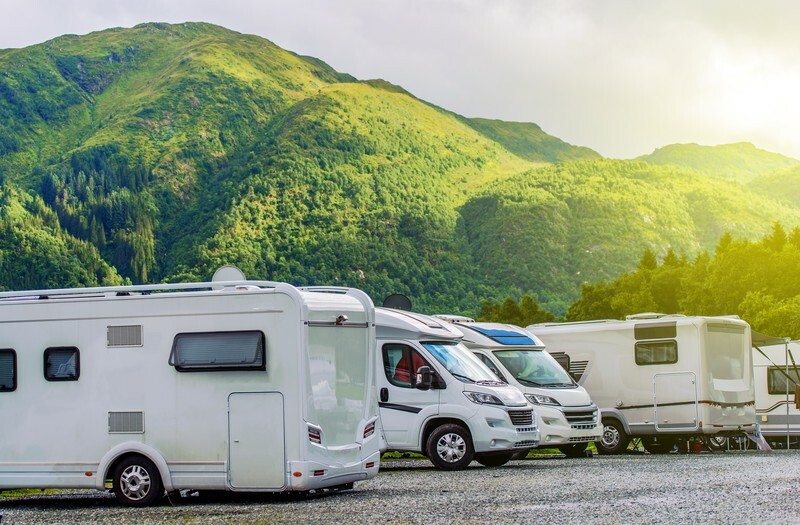 Starting with the distinction between the Class A, Class B, and Class C motorhomes will help you start to narrow down your choices and make the final decision that much easier. Contact us Southeast Financial today to find out how we can help you with RV financing!